Culture can be understood as the tacit assumptions reigning over ‘how we do things around here’. To some extent these can be drawn out into the open and questioned. To the extent that they cannot, they form a strategy ceiling – a level above which it is ‘none of your business’ how a business operates. Culture change is made intractable by the resistance to, and difficulties in, raising the strategy ceiling. This resistance is based on the way the business is used to support the identifications of its members. A theory-in-use describes the organisation of processes, skills, resources and accountabilities governing the ways in which particular kinds of activity may be undertaken by a business. Thus, for example, the theory-in-use of a building governs what it is easy and difficult to do within that building. The nature of the strategy ceiling will be implicit in the way the theory-in-use of a business is used by its members to support their identities. An espoused theory is what people say about the way a business works from their own point of view, of which a systemic view is a special case, defined from the perspective of the outputs of a business as experienced by a particular client-customer as the business takes up a role in his or her life. An innovation, if it is to contribute to the sustainability of a business, must necessarily make sense from a systemic point of view. Forensic process uses the metaphor of serial murders being committed by the business that appear to leave no clues as to how they were committed. The forensic process assumes that the implementation of certain kinds of innovation run up against some aspect of a business’s existing culture that ‘murders’ them. As a consequence, attempts to implement innovations can fail repeatedly in practice, with no-one knowing why they fail. By establishing how these ‘murders’ are done, a forensic process enables a business to learn about its strategy ceiling, and the choices it must face if things are to change. The paradox here is that the members of a business must be prepared to take a sufficiently systemic point of view to see that there might be a gap in what the business is doing that demands innovation – serial ‘murder’ dramatising the idea that some kinds of innovation must be stopped! The aim of a forensic process is therefore to establish what is problematic about the gap being addressed by the implementation of an innovation, and how the culture somehow refuses to take up that problematic. These dilemmas can be elaborated in terms of an impossibility around which they move, which is a way of formulating a dilemma in terms of alternative themes/strategies which offer alternative resolutions of its point of impossibility, but which, when held as a dilemma, enable innovations to be engendered that move the business closer to addressing the impossibility. A forensic process uses case material in order to discover what problematics are being ‘refused’ by the business, thereby establishing where the blockages are to lifting its strategy ceiling. Such a process will not be authorised by senior management unless they are themselves concerned about the current performance of the business from a systemic perspective, and are prepared to use the forensic process to understand how the strategy ceiling needs to be lifted. If one side of a dilemma is held by an informal culture and the other by the formal culture, then insofar as the informal culture seeks to defend its identity through resisting attempts to bridge the dilemma, it will be very difficult for the formal culture to benefit from the informal culture’s learning. Under these circumstances, a key question is why one side is kept ‘informal’ (or in the shadows) i.e. what interests are thus served. 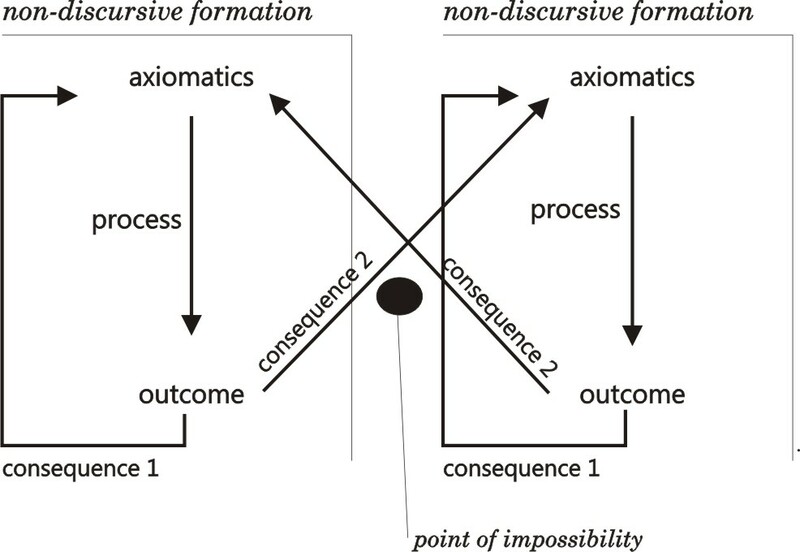 A dilemma arises when two such non-discursive formations have consequences that ‘flip’ to the other formation, so that there is either an oscillation over time between the two formations, or the two formations co-exist within the enterprise, even though only one is identified with the formal culture. The dilemma is defined by the ‘point of impossibility’ around which the oscillation takes place. For example, a business can oscillate between periods of cost cutting and investment in people. This reflects a cyclical response to external business conditions around the impossibility of defining the investment in people in a way that relates to growth in profitability. This oscillation would be a symptom of the inability of the Board of Directors to hold this dilemma effectively at the level of the business as a whole. A dilemma forces a separation between two non-discursive formations that have to be ‘held’ if the effects of the impossibility are not to become dysfunctional. This can be represented in the form of an effects ladder. 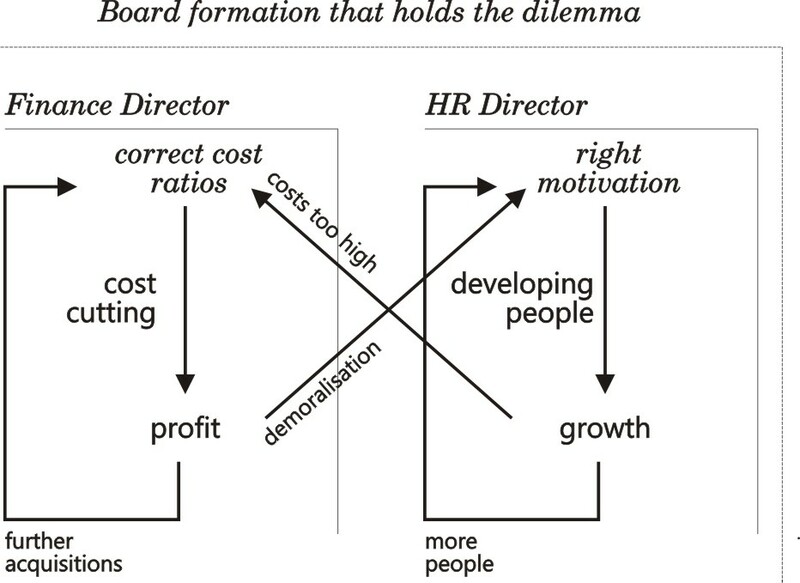 This shows the way dilemmas are held in relation to a larger demand situation, in this case representing value as defined by the Board. The notion of a strategy ceiling is taken up more fully in a later blog. All problems and issues can be thought of in terms of what it is about them which makes them difficult to resolve, tidy up or explain away… underlying dilemmas give problems and issues their intractable nature and ensure that they keep recurring in some form or other. Speaking about the “problematic” nature of problems or issues is a way of referring to the nature of what makes problems ‘difficult’. Toward an Explanation of How the Milan Method Works: An invitation to a Systemic Epistemology and the Evolution of Family Systems in Campbell & Draper (eds) “Applications of Systemic Family Therapy: The Milan Approach” Grune & Stratton 1985. pp69-84. The moebius strip has the topological property of having only one side. If you trace a line along the surface of the strip, you return to the same place you started from. Charles Hampden-Turner. Charting the Corporate Mind: from Dilemma to Strategy. Blackwell 1990. When a business begins to respond to its clients one-by-one, these effects ladders cannot be defined for the business as a whole, but for each client’s way of defining value within their context. Previous PostThe Double Challenge in Engineering Complex Systems of SystemsNext PostConsultancy or Action Research?